I had to try this right? 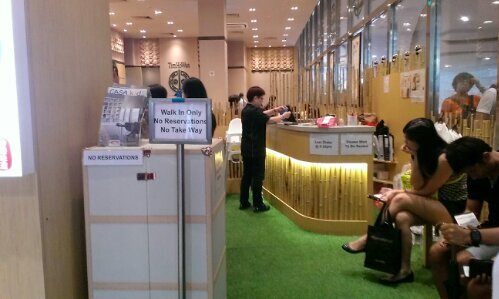 Firstly, it’s a dim sum restaurant. 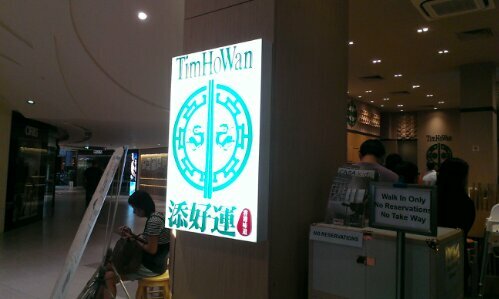 Secondly, it’s from Hong Kong. Thirdly, it’s internationally acclaimed one star Michelin. So I found the perfect opportunity to try this place — on a weekday morning where the crowd, still there, but significantly lesser. One point to note: be sure to make sure that your company is in full strength when it’s your turn. The lady behind me was waiting for 6 others, and by the time I was done with my food one hour later, she was still waiting for her friends at the waiting area. More on the food. Honestly, I was very disappointed. The variety was really very limited, about 30 items thereabout? 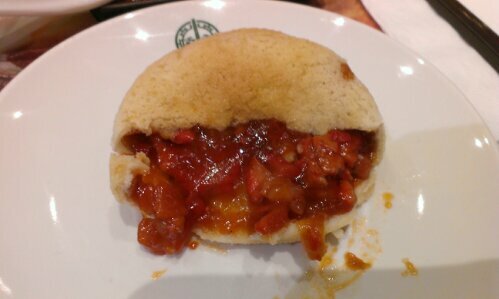 The only redeeming food was their famous char siew bun. It’s limited to 3 plates (9 pieces) person. Heard that when it first opened someone bought 50 peces! Delicious overflowing char siew in a soft, thin, crispy aromatic buttery shell. A definite must try. I guess this is what they’re well known for as well. 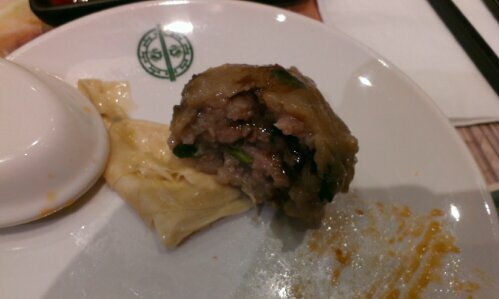 According to my sis, beef balls are quite common and well liked in HK dim sum restaurants. You can try adding the black sauce that’s provided at every table. Not bad I would say. Juicy and flavourful. Chicken claws. I’ve tasted better ones, really. This wasn’t as soft you’d like it to be, unfortunately. Even the sauce that came along with it was as good as nothing. My must have at every dim sum restaurant. Char siew chong fun! Again, disappointing. What makes a good chong fun? The skin and the sauce. The sauce was hardly fragrant. Didn’t even make me lick my spoon a second time. As for the skin…. 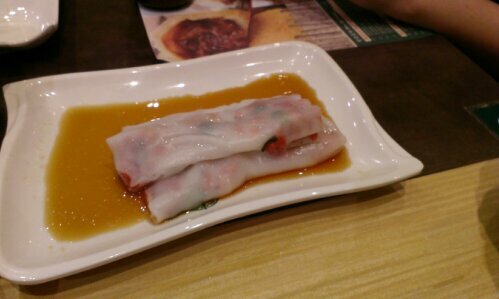 The siew mai was rather horrible as well. Oh great there was a goji on top of every siew mai, but that’s about it. 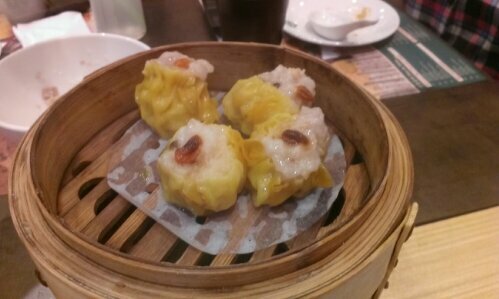 Yes the prawns are huge and chunky, but it does not contribute much to the flavour, especially when the skin of the siew mai tastes strongly of alkaline, the taste you get when you eat not so good quality yellow noodles. Urgh. Just bad. We regretted ordering two servings. Har gao. It came in 4, but my dad was too quick and snapped one away before I could get a picture. A har gao’s skin is important. This….. was too nua I felt. I also ate the carrot cake. The carrot cake was good. It had more water content than your usual ones, so you won’t get really jelat after awhile. For the sake of salvaging your meal, do not, ever order their barley. Not sure if it was because we were early and the barley was barely cooked, but it was tasteless. It tasted like 5% barley 95% water. It was very bad. Never have I tasted such bad barley. I would very much prefer those sold at hawker centres and coffee shops. Heck. Canned barley would taste much better than this. And it’s $2 for a small cup. 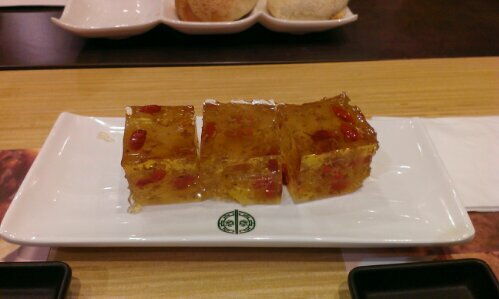 Finally, osmanthus jelly, or gui hua gao. This was delicious!! I had seconds! Very, very fragrant. Overall, my experience was a bad one. Price is not an issue, IF the quality of food is good. Unfortunately, this one star Michelin did not fare well on the price scale, and failed terribly at the food avenue. A dish on average cost $4.50. I have eaten better dim sum at lower prices. 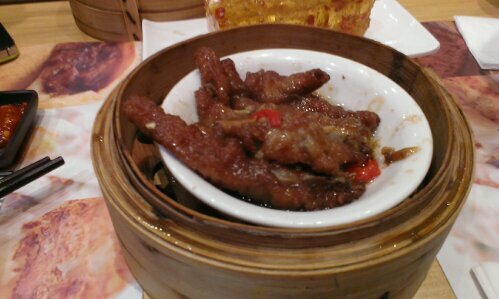 In case you think that I’m some ignorant person and that perhaps dim sum in HK tasted like this, you’re wrong. 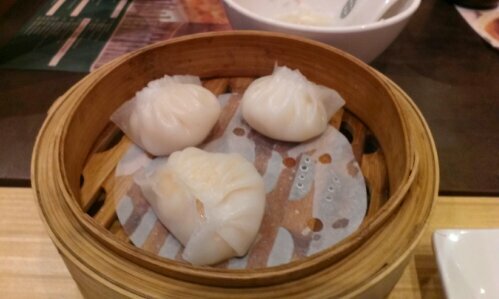 I visit HK regularly, and really, the dim sum there tastes nothing like this. 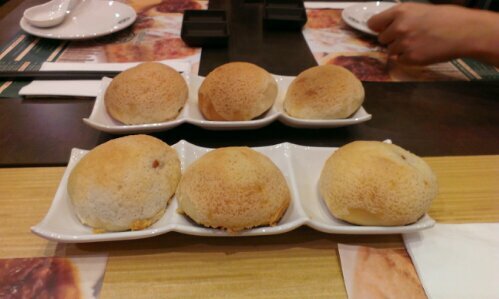 You’re always welcome to try though; afterall their char siew bun was really delicious!